Even for experienced campers when it comes to finding the best camping tents, they still find it a very hard and challenging task. There are many good models of camping tents out there with different materials, design, and dimensions. In fact, there is no single best camping tent but the one which is suitable to your needs and preferences the most. In case you are searching for a good camping tent, take a look at the article below to see which features you need to consider and our list for the top 4 camping tents before making any decision. There are two kinds of tent you can buy based on the seasonality. The first kind is the 3 – season tent which you can use in the spring, summer, and fall. This tent is well ventilated and breathable to keep you cool during hot days. However, if you want to go camping in the winter, a 3 – season tent is not insulated enough to keep you warm. Therefore, 4 – season tent will be your best choice because it uses more poles and heavier fabrics than 3 – season tent. The next characteristic of a tent you need to consider is how big the tent is. It all depends on how many people use the tent and whether you bring a lot of belongings with you when you go camping or not. You have the options of 2- person, 4 – person, 6 – person and 8-person tent. They recommend roughly about how many people would fit inside the tent. However, it is worth knowing that a 2-person tent would fit 2 people with not so much space left. If you bring a lot of equipments with you, consider purchasing for extra room and upgrade into 4-person tent. Also if you like to have a lot of rooms and space inside for indoor activities, you can consider purchasing a tent that can accommodate more people than the number of people who use the tent. If you are a tall person or want to move around your tent comfortably, you should think about this specification. The height of a tent is varied depending on the type of it. For example, a cabin style tent tends to offer more space when you stand. Keep in mind that a dome style tent can offer you a higher number for the center’s height. However, it is in a half circle shape, which means there is not much space left near the outside of the tent. So if you want to have a lot of rooms to walk around easily, a cabin tent is better. Today, the two most common types of material you see on the market are nylon and polyester. Both of these types have their strengths and weaknesses. Nylon: This type of material is much more lightweight and stronger. However, it is more expensive and is not as popular as polyester, mainly due to its price. Polyester: Although this material is not as durable as usual, it is better to shed more water than the nylon. Besides the conventional materials, tent manufacturers also apply a coat of polyurethane or silicone as a protective barrier against the harmful sun rays or the penetration of chemicals. Most of the camping tents on the market come with compact packing sizes so that you can easily pack and carry it around. However, you don’t have a much physical advantage or have a small car; this is one of an essential thing you need to look for in a tent. To make sure you can easily carry your tent around or put it easily on the back of your car before you go to the camping site, choose one with compact packing size. Also, the weight of the packed tent is also enough for you to carry around without feeling any pain. There are three factors that you need to consider when you look at the construction of a tent, which are the floor, the poles, and other accessories. The floor: Make sure the floor is attached with a seam, or it is raised higher than the ground. This design of the floor helps to prevent water from coming into the tent. So that you would be able to stay dry even the ground around your tent becomes muddy after a rainy night. The Poles: Aluminum poles are the best choices for you. Other materials such as fiberglass can snap much more often. Poles that go with clips can make it easier for you to set up the tent. On the other hand, poles with sleeves would be more challenging. Also look for any model with color coded poles for even easier assembly. The accessories: Look for additional options that come along with the tent such as the vestibules, mesh shelves or tarps. These features can help the tent to stay dry, well ventilated and make your camping experience much more enjoyable. Finally, make sure your tent has an easy setup, especially when you are a new camper. The ease of setup also depends on different types of tent. Some tents like the instant or the quick pitch tent can be set up easily by simply throwing the tent out or releasing the knob. Another tent like the rigid type would take you longer. We select the most popular tents which receive good and positive feedbacks from existing customers. We then use these tents and spend several weeks camping in them through various types of weather as well as terrains. We use these tents under the rain, set them up in the deserts, mountains, beaches and even in our backyards. Finally, we can come up with our experience about the best camping tents you could have on the market at the moment. This 4-person tent features a factory sealed main fly and floor seams with 2 doors and 2 vestibules to store your equipment. It is made of 75D polyester taffeta with 1800 mm PU coating. It has the center height of 5 feet. The dimensions of the floor are 8.5 feet x 7.5 feet. It is available in the mineral gray fly, Lime Punch floor, and walls. The new V3 enhanced test system helps to increase the breathability of the tent as well as enhancing the versatility of the tent’s construction. The fly of the tent can offer a huge coverage to help keep the tent away from the rain and the wind as much as possible. It also offers a good UV resistance. It is also very easy to assemble or disassemble the tent thanks to the shock corded aluminum poles along with the clip attachments. Even one person can set up the tent by himself. It might be heavier and larger than other 4-person tents, which makes it less portable. Verdict: It is a great camping tent for a small family with 2 adults and 2 kids. 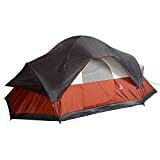 A couple or a solo camper might enjoy this tent in case you tend to bring a lot of stuff with you. This 8-person tent features room dividers that allow you to create three different rooms. It is made of 75D polyester taffeta with 1800 mm PU coating with the newest and most innovative technology of Weathertec System. It also features a Cool-air port and Veriflo adjustable venting system. It has the center height of 72 inches. The dimensions of the floor are 17 feet x 10 feet. It is available in red, blue or black. This tent provides a huge space which you can divide to make separate rooms for separate purposes. You also have a lot of privacy thanks to the room dividers. You will find it easy to set up this tent thanks to the color coded poles. Also, the instructions that you find in the package also include a very detailed guide for you to quickly assemble. With highest technologies applied to this tent, it is very well ventilated and breathable. It is also very durable and highly resistant to wind and rain. The seam on the main pole support sleeve was a bit poor. And when there was tension in the pole from the bend, it starts tearing apart. The window which is attached to the hinged door could not be shut, which might make it cold for you when the wind breezes in. Verdict: This is a great tent for a family of 6 to 8 people. It is best used in the spring, summer, and fall. 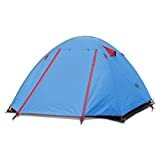 This tent is available in many colors including green, blue, orange and azure. It has the weight of 6.2 pounds and the dimensions of 7.1f (W) x 4.3f (H) x 7.1f (D). There is one room to go with doors that can be opened from both inside and outside. The material of the tent is made of high quality that is waterproof and well ventilated. It is also SPF proof with a special UV coating and breathable nylon. Moreover, this tent is very compact and light that you can roll over and bring along with your backpack. Verdict: This 4-person tent can be used when you go camping on the hot summer days as well as rainy seasons. This 6-person dome tent is made of 75D polyester taffeta with 1800 mm PU coating. It has the center height of 72 inches. The dimensions of the floor are 96 x 120 inches. It features 4 poles which are made from DAC DA17 aluminum with taped seams on the floor and fly. It also has a mesh wall panels. It is available in gray and white. It is easy for you to set the tent up in all kinds of surfaces including even or sloping surface. Also, setting the tent up in the desert or mountainous area is not a difficult challenge. The material of the tent is of high quality that can have good resistance against the UV rays, salt, dirt and other harmful elements. There are a lot of pockets around the tent so that you can easily organize and store your gear and equipment. All zippers of the tent work perfectly smooth and cause no noise when you pull them. The stakes of this tent tend to bend much more easily, so you need to be careful when handling these components. 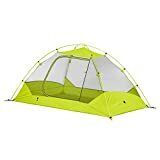 Verdict: This tent is suitable for a family of 4 to 5 adults when they go camping in the spring and summer. It is a great option to use in rainy seasons. I hope that with the information and camping tent reviews above, you would be able to find the best camping tent that suits your requirements and needs the most. Keep in mind to look for the seasonality of a tent, its dimensions, material and its construction. I am sure that you make the wisest decision and make a very worthy investment in the long run.